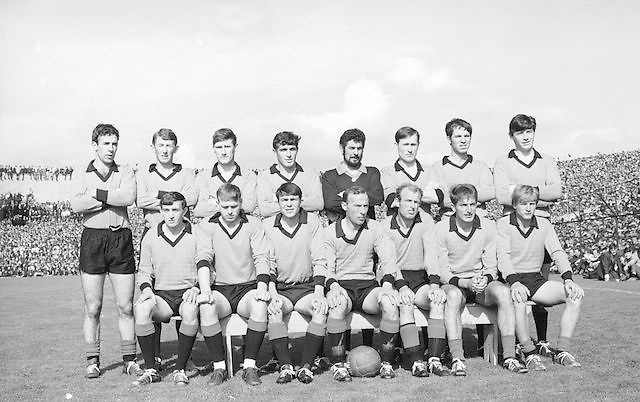 The Mayo team before the Kerry v Down All Ireland Senior Gaelic Football Final, 22nd September 1968. The Down team before the All Ireland Senior Gaelic Football Final Kerry v Down in Croke Park on the 22nd September 1968. Down 2-12 Kerry 1-13. Back row (from left) Tom O'Hare, John Murphy, Ray McConville, Willie Doyle, Danny Kelly, Sean O'Neill, Jim Milligan, Dan McCartan. Front row (from left) Brendan Sloan, Peter Rooney, Micheal Cole, Joe Lennon (capt), Paddy Doherty, Colm McAlarney, John Purdy.